Would you like to display captions below the thumbnails? This is very easy to do in Envira by simply clicking a checkbox. We’ll walk you through the steps on how to display image captions below your gallery images. Can I customize the caption appearance? Why isn’t my caption showing under the image? To display captions below gallery images, click on the Configuration tab. Look for the Enable Title/Caption? and be sure to click the Caption checkbox. Finally, just click Publish or Update to save the changes to the gallery. And that’s it! It’s really that simple! Would you like to use WordPress featured images for your galleries? 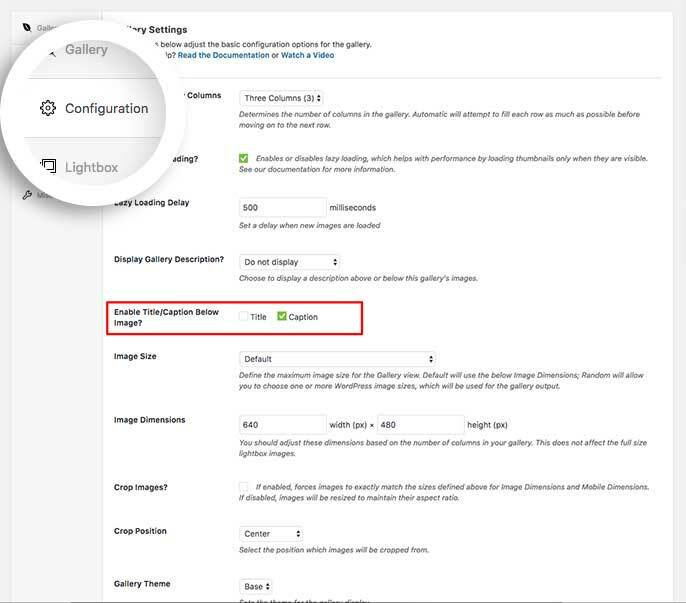 Take a look at our tutorial on How To Set Featured Image for Albums and Galleries. Q: Can I customize the caption appearance? A: Absolutely! Using CSS you can change just about anything with Envira captions. Take a look at our article on How to Style Image Title Hover Effects. Q: Why isn’t my caption showing under the image? A: If you’re using an Automatic gallery for your Number of Gallery Columns, the caption will show at the bottom of the image when you hover over the image.